The exhaust gas recirculation valve popularly abbreviated as the EGR valve reduces gas emissions, improves engine performance while enhancing the fuel economy of the vehicle. The EGR valve works by ensuring a fraction of the exhaust gasses from the exhaust system are recycled back into the combustion chamber and this regulates the temperature of the combustion chamber. With a regulated combustion chamber, nitrogen oxide formation which forms a major constituent of fog is prevented. However, the gasses short-circuited into the combustion chamber gradually deposits carbon within the valve. The clogging up of carbon within the valve reaches a point when it prevents the EGR valve from closing or opening. With an unregulated opened EGR valve, exhaust gases pass into the combustion chamber without regulations and this affects the combustion process which reduces the efficiency of the engine. A persistently closed EGR valve leads to the overheating of the combustion chamber. This causes the ignition of the fuel before combustion; a phenomenon popularly known as knocking. Knocking can damage an engine and continually diminishes the durability of the engine. 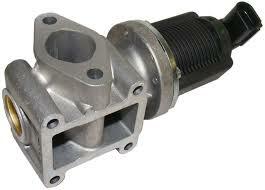 To clean the EGR valve, you will need to locate and unhook the valve from the engine. The position of the valve varies with the model of the car. With the help of your vehicle manual, you should be able to locate the valve. Disconnect the vacuum hose connected to the EGR valve. Ensure to check the vacuum hose for damage and if any, endeavor to change the vacuum hose. A damaged vacuum hose can reduce the efficacy of the valve after cleaning. Remove the mounting bolts of the valve using a ratchet and socket. Detach the pipe connected to the EGR valve from the exhaust system using a wrench. Check for any accessory connected to the device and disconnect as well. Remove the EGR valve. Ensure you check the EGR valve gasket for damage and if any, change the gasket. Before you commence cleaning the EGR valve, take appropriate safety precautions such as chemical resistant gloves and safety glasses. You can clean an EGR valve by using a screwdriver to remove the chunks of carbon clogging up the valve and wiping the accessible parts of the valve with a rag. This is a much easier and quietly effective step. However, you can use an EGR cleaner ( liquid) to clean the valve. However, ensure the cleaning solution doesn’t get in contact with any electrical component of the EGR valve. This can damage the valve. After cleaning the valve, refit it to the engine. Refit the pipe from the exhaust system and the vacuum hose to the valve. Refit any wiring harness removed initially. Verify the effects of the cleaning process by turning on the ignition. The absence of the peculiar ‘knocking’ phenomenon and the reluctance of the engine during warming which is typical of a clogged up EGR valve is evidence of an effective EGR cleaning process. In conclusion, the exhaust recirculation gas valve might seem small compared to several other components of the car but its function cannot be overemphasized.